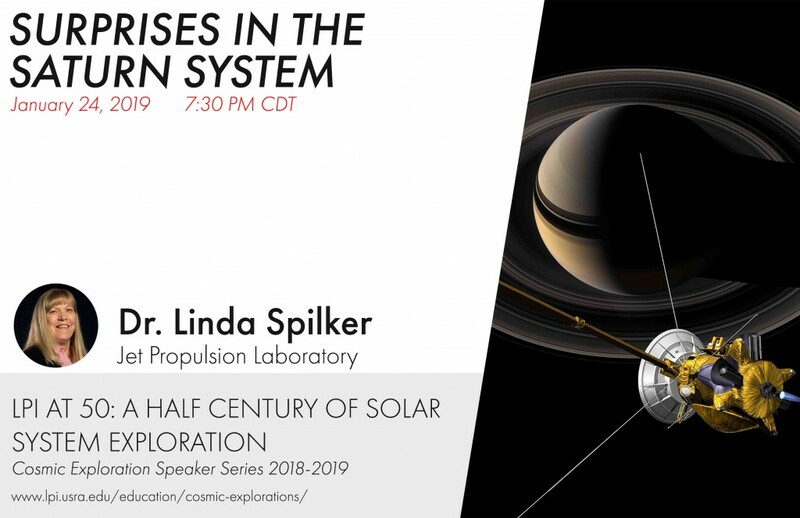 The LPI invites inquisitive adults interested in current topics in space science and exploration to join us for the third presentation in the 2018-2019 Cosmic Explorations Speaker Series, Surprises in the Saturn System, given by Dr. Linda Spilker from the Jet Propulsion Laboratory. The presentation will be held on Thursday, January 24, at 7:30 p.m. CST. The presentation will be streamed live through the USRA Ustream channel. Past recordings are available on LPI’s YouTube channel. This entry was posted in Community Announcements and tagged Cosmic Explorations, public engagement on 2019-01-14 by Linda Chappell.